Until recently, I worked as a temp, and more often than not I had plenty of time to devote to “royal watching:” staying up until all hours of the night to catch live streams, spending time researching the royals and their history and crafting posts to share with you, and even occasionally shopping to create a new RepliKate outfit – both to make my wardrobe more like Kate’s and hopefully inspire you, whom I have always called my lovely readers, do the same. It was easy when I didn’t really have anywhere to be the next day. However, in January, I took on a new temp job, and in May, they hired me. I am incredibly thankful to have a full-time job, but by the Spring, my workload had increased to the point that I was working an hour of overtime each day – and with an hour for lunch, that meant I was spending ten hours a day at the office. (And on top of that, I sort of fell into the role of co-director of the children’s program at my church.) Unfortunately, my situation, which at present shows no sign of changing, no longer spares me much opportunity to watch live streams that begin when I should be in bed. (I confess that I have never been much of a morning person.) And as I have always prided myself on doing due research on a topic before I write, this left me without much to say on several topics, from the christening of Prince Oscar and Princess Charlotte’s appearance at Trooping the Colour to rumors of Emperor Akihito’s desire to abdicate and the usual gathering of royals at this summer’s Olympic Games. I should have said something much sooner. I have been humbled by the number of visitors to this blog, and have always intended to treat you as well as I feel you have treated me. I am very sorry that I have not done so. 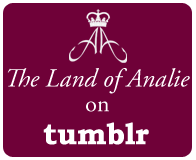 I don’t want to close this blog permanently, nor do I want to let it sort of fade into nothingness. I hope to update occasionally, but as I can’t predict the future, I can’t say anything concrete. Thank you all so much for believing anything I have had to say was worth your time. Saturday was the 400th anniversary of the death of William Shakespeare (as far as we can tell) and is also the day that Shakespeare’s birth is observed (for reasons that are beside the point here). The British Broadcasting Corporation, along with the Royal Shakespeare Company, presented a special night of celebrating Shakespeare’s life and legacy with performances of scenes from his plays as well as works from other artists that have been inspired by him. One such performance centered on one of the most well-known quotes from Shakespeare: “To be or not to be, that is the question,” from Hamlet. In this sketch, seven different actors (many of whom have played Hamlet in the past) help actor Paapa Essiedu (who is currently playing Hamlet with the RSC in Stratford-Upon-Avon) figure out the best way to perform such a famous line. The last person to give his input is Prince Charles, who attended the performance with his wife Camilla, The Duchess of Cornwall. Of course, like everybody else, his input is not very helpful. If you’re interested in seeing more, RSC OnScreen will be replaying this special in theatres on May 6. In the United States, FathomEvents will be broadcasting it in theatres on May 23. More information can be found in the links. The cabinet of Sweden met Thursday in honor of the birth of Prince Carl Philip and Princess Sofia’s son, and his names were announced. His full style and title is His Royal Highness Prince Alexander Erik Hubertus Bertil, Duke of Södermanland. The announcement from the Royal Court can be read here. The announcement does not explain who he is named after, so Alexander may simply be a name they both liked. Erik is the name of Sofia’s father, and Bertil is one of Carl Philip’s middle names (Carl Philip Edmund Bertil) and the name of Prince Bertil of Sweden, Carl Gustaf’s uncle and one of Carl Philip’s godfathers. The ducal titles in Sweden are mostly in name only, and only high-ranking members of the Swedish Royal Family are given them. The names are taken from the historical provinces of Sweden (though most of these historical provinces don’t exist as such anymore); the last Duke of Södermanland was Prince William of Sweden, son of King Gustaf V.
The first photo of Alexander has been shared by the Royal Court, which you can see here. A boy for Carl Philip and Sofia! ≈ Comments Off on A boy for Carl Philip and Sofia! It was announced today that Princess Sofia of Sweden has given birth to a boy. This is the first child for both Sofia and Prince Carl Philip, and the fifth grandchild for King Carl Gustaf and Queen Silvia. Both Sofia and the little prince are doing well. Carl Philip spoke to the press at a small press call (photo above) to share about his new son. He said that everything went well and how overwhelmed with emotion he and Sofia are at finally meeting their new son. Sometime soon, probably later this week – and perhaps as early as tomorrow – King Carl Gustaf will meet with his cabinet to reveal the baby’s name and dukedom. The new little prince is now fifth in line behind his father Prince Carl Philip. In cousin-ly news, the christening of Prince Oscar has been announced for Friday May 27. After the hubbub over Nicholas’ christening, hopefully SVT or another Swedish network will cover it, as I’ll have to miss it because of having to work that day. The cabinet of Sweden met today in honor of the birth of Crown Princess Victoria’s son, and his names were announced. His full style and title is His Royal Highness Prince Oscar Carl Olof, Duke of Skåne. The announcement does not explain who he is named after, but Oscar is the name of a small number of Swedish kings. Carl is not only the name of Victoria’s father (Carl XVI Gustaf), and brother (Prince Carl Philip) but is probably the most common name of Swedish kings – especially in the Bernadotte dynasty, but going back to at least 1550 and Carl IX. (King Carl IX was actually only the third king named Carl, but called himself Carl IX because of a fictional history of Swedish Kings. Every Swedish King Carl after him kept the count going anyway.) Olof is Prince Daniel’s first name (Prince Olof Daniel Westling Bernadotte), but also the name of the second King of Sweden, Olof Skötkonung, who reigned in the late 900s. The ducal titles in Sweden are mostly in name only, and only high-ranking members of the Swedish Royal Family are given them. The names are taken from the historical provinces of Sweden (though most of these historical provinces don’t exist as such anymore); the last Duke of Skåne was King Gustaf VI Adolf, Prince Oscar’s great-great-grandfather. A boy for Victoria and Daniel! ≈ Comments Off on A boy for Victoria and Daniel! Princess Estelle has a little brother! It was announced today that Crown Princess Victoria of Sweden has given birth to a boy. This is the second child for both Victoria and Prince Daniel, and the fourth grandchild for King Carl Gustaf and Queen Silvia. Both Victoria and the little prince are doing well. Daniel spoke to the press at a small press call (photo above) to share about his new son. He said that everything went well and little Princess Estelle – who turned 4 last week – was asleep at the time, so she’ll wake up to find out she has a little brother. Sometime later this week – perhaps as early as tomorrow – King Carl Gustaf will meet with his cabinet to reveal the baby’s name and dukedom. 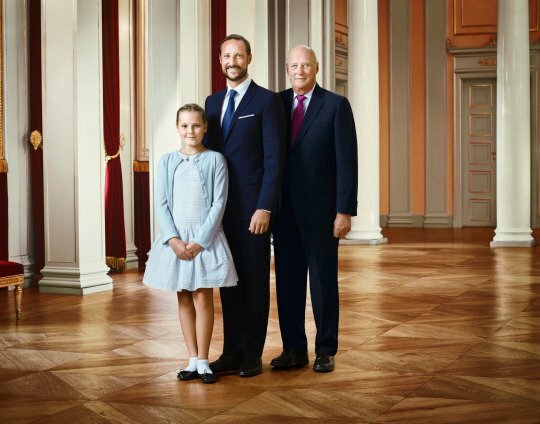 Sweden has absolute (aka gender-blind) primogeniture, which means that Estelle cannot lose her place in the succession after her mother (who – since the succession law went into effect in 1980 – will also succeed to the throne of Sweden ahead of her younger brother). The new little prince is now third in line behind his mother, Crown Princess Victoria, and Estelle, and ahead of his uncle Prince Carl Philip. Today was a day of mixed emotions in the Swedish Royal Family, as it was announced earlier in the day that Johann Georg Prince von Hohenzollern, husband of Carl Gustaf’s sister Princess Birgitta, passed away at the age of 83. My thoughts go out to Princess Birgitta and her family. NB: This post has been edited to include video. Video courtesy Min Stora Dag. Princess Madeleine of Sweden is the royal patron of Min Stora Dag (“My Big Day” in English), which grants special experiences to severely ill children. (It’s the Swedish version of the Make-A-Wish Foundation.) Sometimes, in addition to helping individual children, Min Stora Dag will also put together group events, such as the one today. Princess Madeleine – joined by her daughter Princess Leonore, who just turned 2 – hosted a fairytale tea party at the Royal Palace for a handful of children from Min Stora Dag. According to People Magazine, the children were treated to juice, cake, and cookies and a show by a sleight-of-hand magician. But the best part to me is how the children were received. 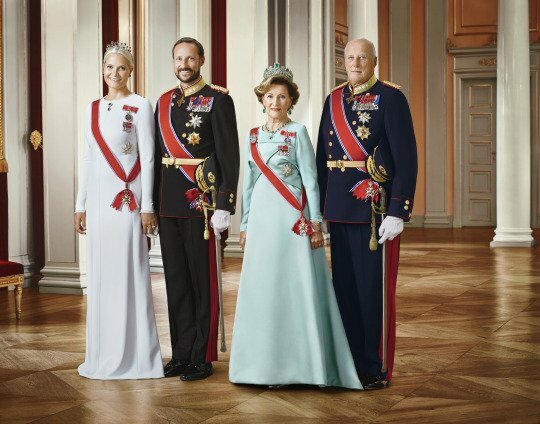 You can see by the video (and the photos that were shared by the Palace and Madeleine’s Facebook) that the room is decorated to the hilt, as it would be if the palace were playing host to grand dignitaries, and Princess Madeleine is dressed for a gala occasion in gown, tiara, and her Order of the Seraphim sash and star, as well as her family order. (Svensk Damtidning says Madeleine wore this same gown and tiara to the Nobel Prize Banquet back in December.) And then she sat on the floor with the kids. This story and these pictures really brightened my day, and I wanted to share it with you all, my lovely readers. 🙂 Also, I don’t do this very often, but Make-A-Wish is a charity I am a big fan of. You can follow the links if you would like to donate to Min Stora Dag (link in Swedish) or the Make-A-Wish Foundation (USA) (International). This past weekend, King Harald V of Norway celebrated his silver jubilee, marking 25 years on the throne. Harald ascended the throne on January 17, 1991, on the death of his father, King Olav V.
Since Harald’s accession anniversary fell on a weekend, the day was full of many events and activities. On Saturday evening, Crown Prince Haakon and Crown Princess Mette-Marit hosted a private dinner for the extended royal family. Sunday featured a service in the Palace Chapel, a winter sports day, a balcony appearance, and a gala performance. Gratulerer to King Harald on 25 years, and here’s to many more. Yesterday was the annual New Year’s Eve speech by Queen Margrethe II of Denmark, and at the end, she announced that her husband, The Prince Consort of Denmark, will be retiring beginning January 1, though Prince Henrik did attend today’s New Year’s Day levee (a banquet given for royal and government officials). It is said that Prince Henrik will continue to support his patronages, but will be giving up state events and the public side of being royal. No reason was given apart from 81-year-old Henrik’s desire to “slow down,” and I’m not familiar enough with him to try and make comments about his apparent health or whether he has medical issues. There have been some people wondering whether this is in relation to remarks Henrik made last year about wishing to be called “king consort” because he is married to a Queen. However, we may never know for sure. It is a little unusual for a senior royal (much less spouse to a sovereign) to step back from royal duties without giving a reason, but regardless, I wish Prince Henrik a happy retirement and many happy moments with his family. I also wish you, my lovely readers, a very happy 2016! It’s too soon to tell, but if this is any indication, we might be in for a year of surprises! It’s been announced that the christening of Prince Nicolas of Sweden will take place on October 11 (one week from tomorrow), and you will be able to watch it on SVT Play here. The broadcast should begin around 12 noon Stockholm time; you can convert to other time zones here. Apparently SVT had decided not to broadcast the christening service, but changed their minds after public outcry; they will be producing a scaled-back broadcast. Get posts sent directly to your RSS reader! © Robyn H and The Land of Analie, 2012-2017. Unauthorized use and/or duplication of this material without express and written permission from this blog’s author and/or owner is strictly prohibited. Excerpts and links may be used, provided that full and clear credit is given to Robyn H and The Land of Analie with appropriate and specific direction to the original content.